Should I go out this weekend? Should I call my parents? Should I drive or walk? Should I open up my email? Should I have coffee or tea? Do you struggle with making decisions, even the small ones? You are not alone. We make hundreds of decisions every week. From minor, (what should I eat tonight? ), to major (should I change careers?). The decision making starts from the moment we wake up, so it’s only natural that there are times when we struggle and become indecisive. Small decisions can sometimes cause more anxiety than big ones because there are so many of them, often hundreds to thousand in a week. We are afraid of the outcome. The unknown can be scary. We don’t want to make a mistake. But it doesn’t have to be so difficult. I work with a lot of people in my one-on-one coaching practice, and my workshops, on steps you can take to make decision making easy and get unstuck. 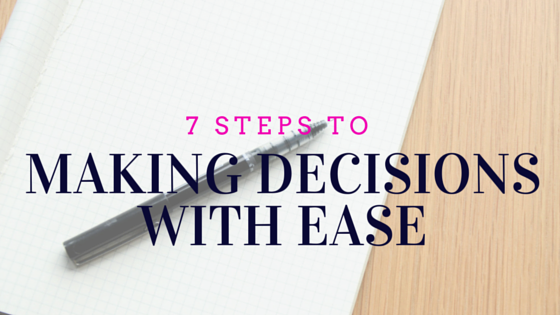 Here are 7 steps you can try the next time you have to make a decision that causing you anxiety or stress. The more stressed you are about making the decision, the more difficult it will be. Take a moment, close your eyes and relax your body and mind. Making a decision from a restful place will ensure that you don’t make a knee-jerk reaction that you might regret later. Take the time to ensure you feel right about the choice you are making. David Ramsey, of EntreLeadership says, the bigger the decision, the more time you should take.What does your gut tell you? There is a difference between taking time to make a decision and procrastinating because you are afraid. Procrastination is the best way to not move forward. Set a date in your calendar, and on that date, make a decision. “I will make a decision by…” When that date comes, you are going to be prepared and take action. No excuses, just action! Visualizing yourself in the decision helps you see the choices you might have to face. Visualize the outcome, how you feel, what you want, who is there with you. See yourself actually living in it. Visualizing is a great tool to help you become unstuck. Seeing yourself in a positive situation will help inspire you, and often removes the fear by motivating you to move forward and take action. Every time a decision goes well, note how you made it happen. Writing about your successes is an amazing tool for motivation and inspiration. Often, we forget about all the great things that we have done because we are stressed or focused on something negative. I recommend keeping track of all your successes. Think of it as your own personal troubleshooting manual, guidebook, or I’m awesome list – Something to help you in the future when you feel stuck. Ask yourself if the outcome is what you expected. If yes, put it in your success journal. If no, ask yourself what you would do differently next time. Create a list of all the things you will do when faced with a similar decision in the future. That way, when it comes up, you are already prepared and ready to take action. Research your options, and speak to other people who have made a similar decision. This helps you get unstuck when you are caught between two choices. The more options you have, the more information you have to make it easier to make the decision. Which one has more pros? Which one really inspires you and makes you say, “Yes, this is exactly what I want to do.” That is the decision you should make. Trust your gut! #7 Make a Choice and Be Prepare To Live With The Outcome – Positive or Negative. It isn’t the end of the world if you made a decision and the outcome wasn’t what you expected. Just refocus, reset and move forward. You can’t rewind, so there is no point holding on to the negativity and disappointment. Take the lessons learned and move forward. What is the lesson? What will you do differently next time? Failure only exists if you don’t try. When you try, there is winning and there are lesson.